Markets opened up, but right out of gate gave it all back and then some in just a few minutes. Not an encouraging way to start the week. Opening strong and finishing weak is a common trait in declining markets. Typically this pattern is due to amateurs bottom-picking with their overnight orders that fill at the open and then institutional investors using that strength to sell into. This sell-off is especially hard on tech stocks that lead the huge first-quarter rally. 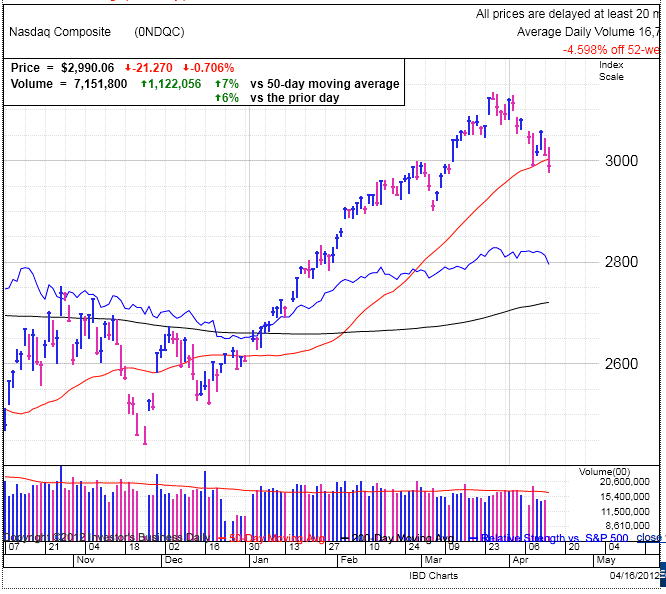 NASDAQ and AAPL lead on the way up and seem to be leading on the way down. The NASDAQ sliced through the 50dma today and the disconcerting thing about AAPL is it didn’t even participate in last week’s two-day rally and has been down five days in a row in an accelerating fashion. AAPL’s is finding support at $580 from its recent gap-up, but if that doesn’t hold, the 50dma is clearly in play and we’ll see if it find support at the $550 level where the rally paused back in Feb. No doubt this is a favorite stock and it will find lots of bids on the way down, cushioning any weakness it might encounter. But the harder part is deciding if smart money is buying AAPL’s dip, or selling the weakness. And of course it doesn’t have to be an either or proposition. 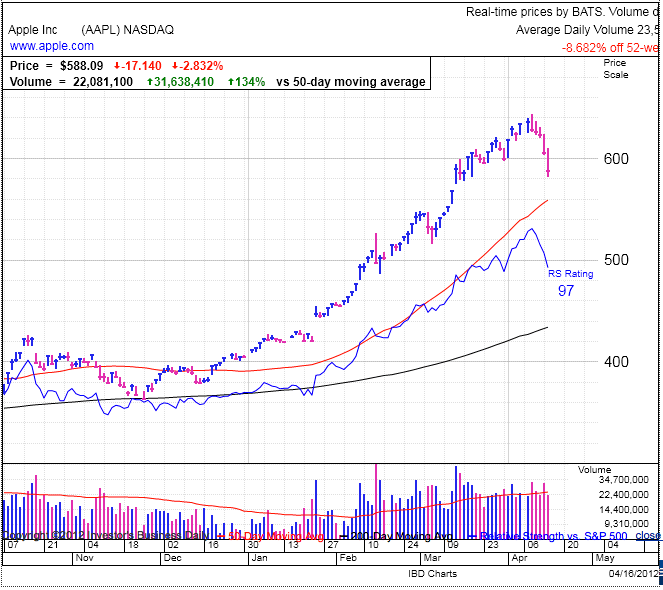 AAPL could be a short-term sell and a long-term buy, so it really comes down to a trader’s time-frame. It is still early in the day and an afternoon rally could completely change the tone of this morning’s price action. If the buy-the-dip crowd shows up in force and steals control from the bears, that would would be extremely bullish. But if the bulls rollover here, we could see the market slide a bit more before this sell-off is done. But for those trying to hold, remember the market often bounces at the point of maximum pain. Keeping that in mind, use the rules you previously set out for yourself and stick to them. For those that raised cash recently by selling into the strength, keep an eye out for a buying opportunity that could be just days or weeks away. As with most sell-offs, they tend to be a bit overdone and will bounce off of their oversold levels once the market finally finds its footing. Other trader’s emotional impulses are your buying opportunities. But don’t try to bottom pick and wait for an upside follow-through to get you back in the market. It is better to be a little late than a little early.